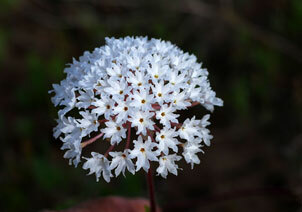 Also Called: Snowball sand verbena. Stems: Erect to trailing or reclining with tips ascending, few to numerous, 1 to 4 feet long, branched from base and above, finely-hairy, sticky, sometimes whitish. Leaves: Opposite, pairs often unequal, simple, fleshy, variable, ovate to triangular or lanceolate, 1/2 to 4 inches long, lower surface paler; tip rounded to pointed; stalk .4 to 2.8 inches long, sticky-hairy to rarely smooth. Inflorescences: Heads, showy, 1 to 2.5 inches across, 10- to 40-flowered, on long stalks in upper leaf axils; heads subtended by 5-7 distinct bracts; bracts ovate to broadly lanceolate, 1/3 to 4/5 inch long, 1/6 to 1/2 inch wide, whitish, sometimes pinkish or purplish, tips pointed. Flowers: Sweet fragrance; calyx corolla-like, funnel-shaped; tube narrow, slender, 3/5 to 4/5 inch long, purplish-pink, expanded at tip into flat limb; limb 5-lobed, 1/8 to 2/5 inch wide, white or pinkish; corolla absent; stamens 5, not extending beyond tube; stigma linear. Fruits: Achene, enclosed by hard, leathery, winged, top-shaped calyx base; achene egg-shaped, about 1/10 inch long, lustrous, black or brown, 1-seeded. Habitat: Sandy prairies, stream valleys, dunes, waste places, roadsides; dry, loose sand. Distribution: Principally west 1/3 of Kansas. Uses: Native Americans in the Southwest steeped the plant and used the cold tea as a wash for sores, insect bites, and boils; ate the fresh flowers to treat stomachaches; and ate the ground roots mixed with corn meal to increase one's appetite. The flowers were also made into ceremonial necklaces. Comments: The flowers open late in the afternoon and close again the following morning. The flowers sometimes wither but often persist after flowering. The genus Abronia is native only to North America and Mexico. From the Greek abros, "graceful or delcate", in reference to the bracts and flowers and Latin fragans, "fragrant".